Do you love hidden valleys with bewitching views? 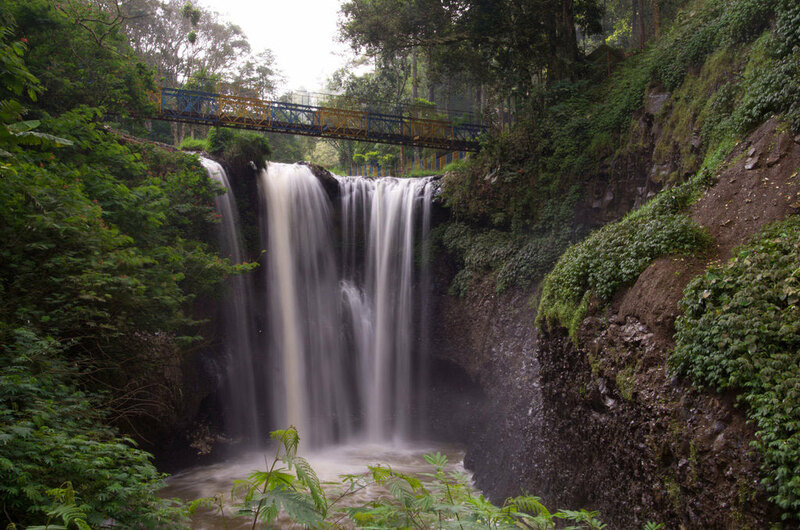 You will find not just stunning waterfalls (Curug) in Bandung, hidden from the tourist crowds, but also walking trails with adventure at every corner, through overgrown vegetation, and mysterious stories behind every curug (which means waterfall in Sundanese). 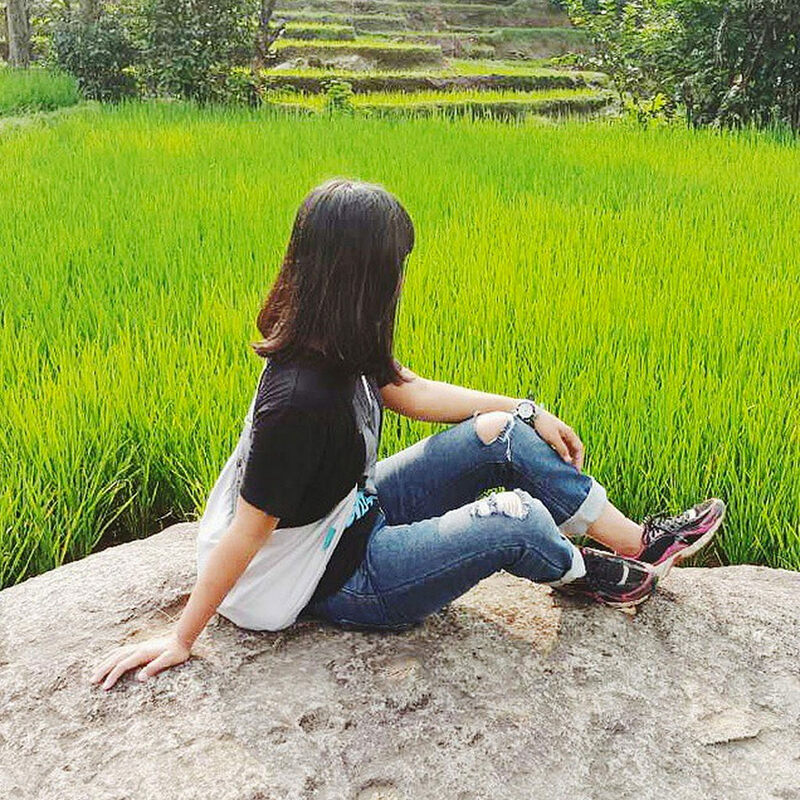 Get your eyes and hears ready to receive the beauty of water, folklore, and scenic routes littered with rice paddies that will lead you into a native territory. Price/Entrance fees: Rp. 15,000 (USD $1) before 5pm and Rp. 17,000 (USD $1.17) after 5pm for locals. Rp. 25,000 for foreigners (approximately USD $1.71). 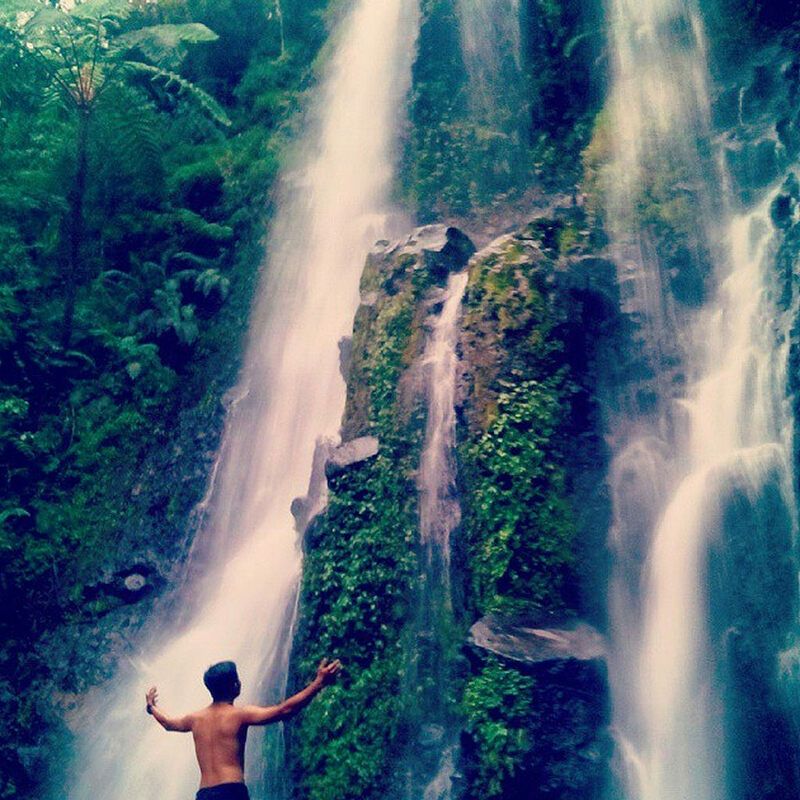 This waterfall is located in the Village of Sindulang, between the borders of Sumedang and Bandung. Within the area there are two waterfalls 50 m tall, and the other one 30 m away. Here, the clear water bears tranquility and peace. The swift flowing stream lets visitors enjoy the river water, but there’s actually more. 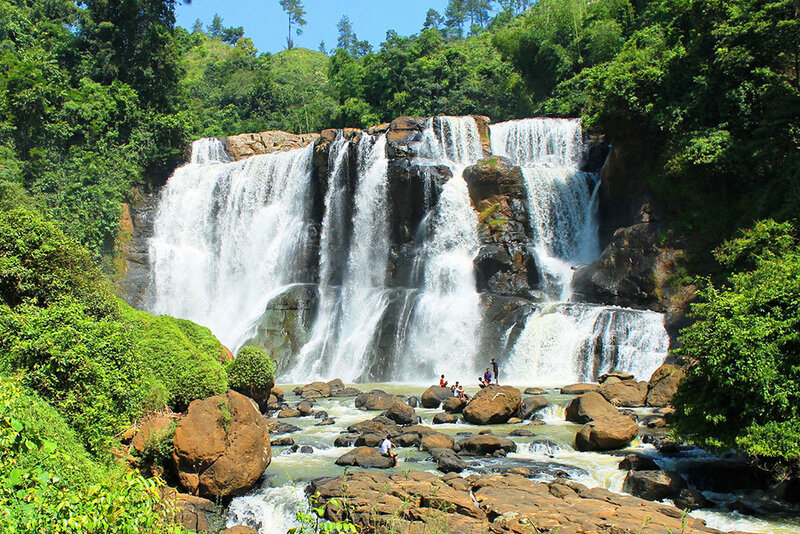 On top of the magnificent waterfall, you can also climb up the hill right beside the river which flows into the main waterfall. A children’s playground, a variety of dishes, stalls and accessories are nearby. This is definitely the place to bring your family to – and get the kids to learn about nature and its beauty. Getting there: Driving on the smooth road makes it easier for vehicle access. 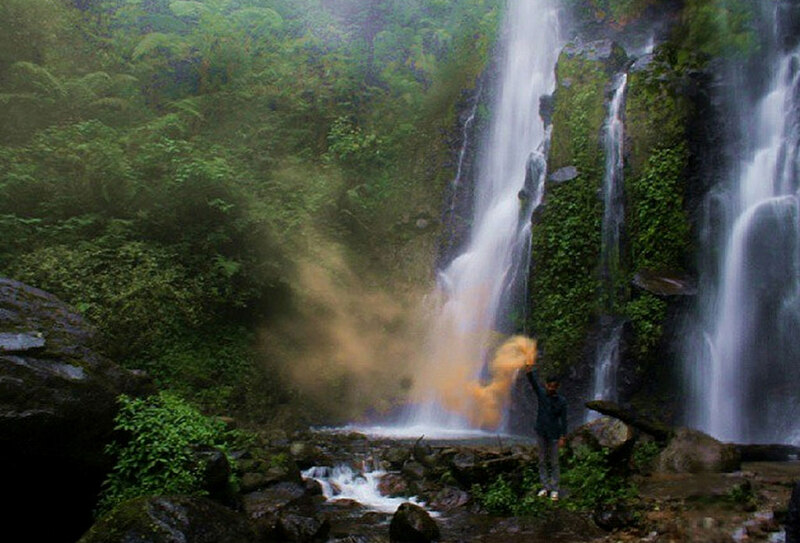 East of Bandung for 11km, there is a sign that says Cinulang Waterfall. 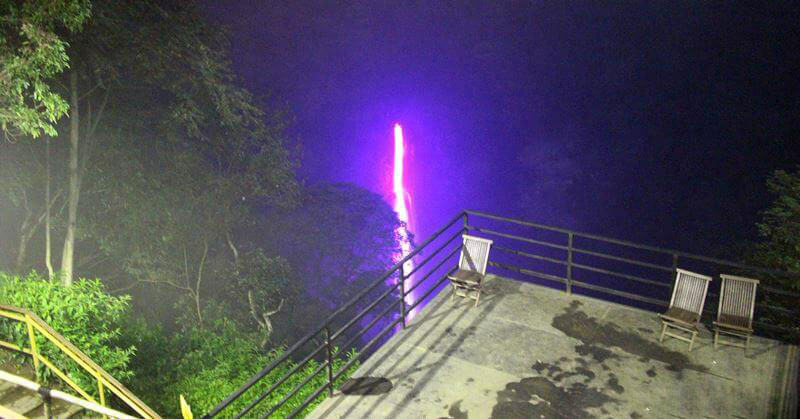 The waterfall is about 2.5 km from the sign. 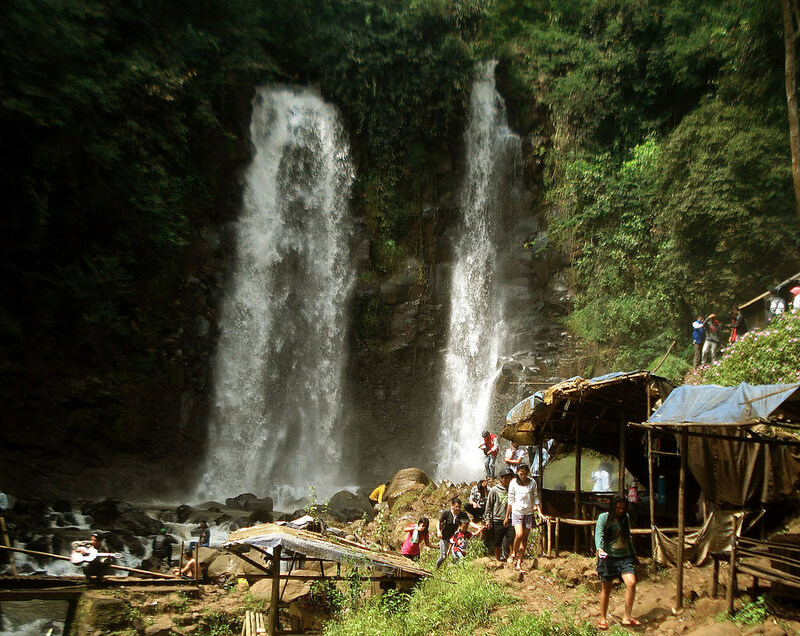 Here, you can enjoy eating grilled corn on the cob or sticky rice made by the locals in the area while you watch the waterfall. Doesn’t that sound like a perfect day trip? 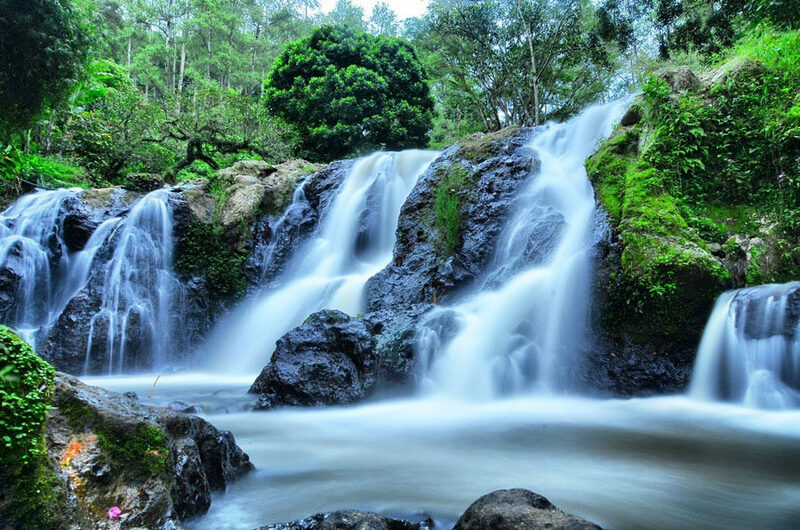 A forest melded with a waterfall, and only 15 km north of Bandung, it’s a splendid place to take a break under the dense vegetation with the whole family. This place was famous for thermal bathing areas in the past. 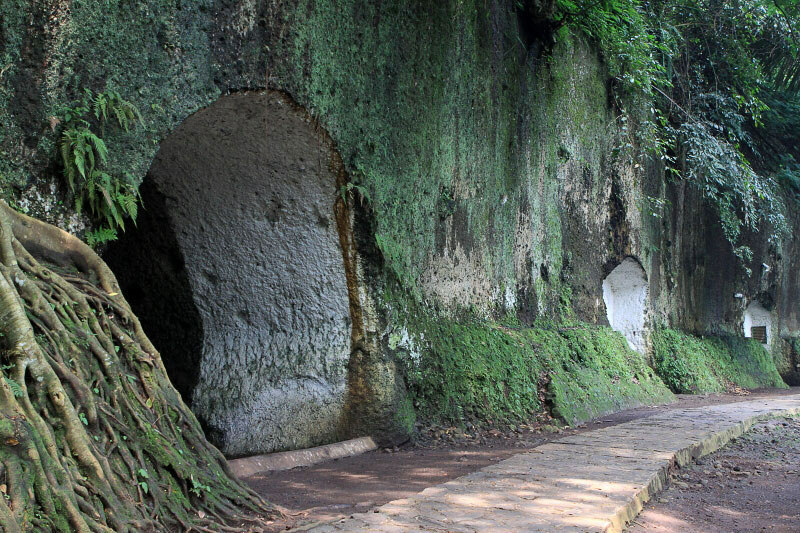 Now, a relic cave (in Juanda Forest) is the attraction. Remember to bring flashlights if you plan to venture in. 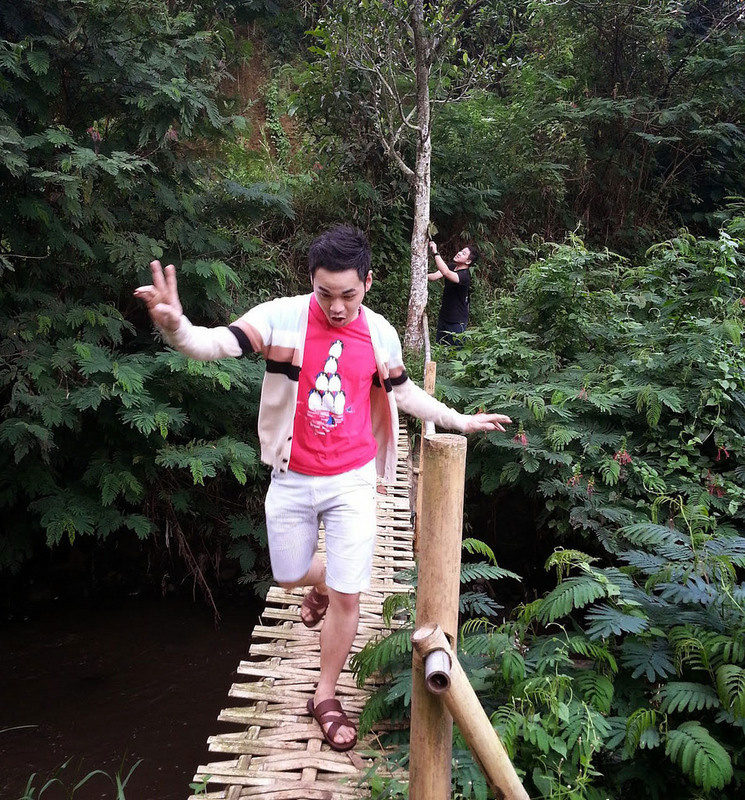 When arriving at Maribaya, there are 10-15 different routes you can take, making it a very comfortable place for you and your family to explore the riverside, cross the bridge, listen to the gurgle of the waterfall and soak in the the chill of North Bandung. If you are returning from Lembang, don’t forget to buy fresh milk as a pleasant souvenir after the beauty of Maribaya. 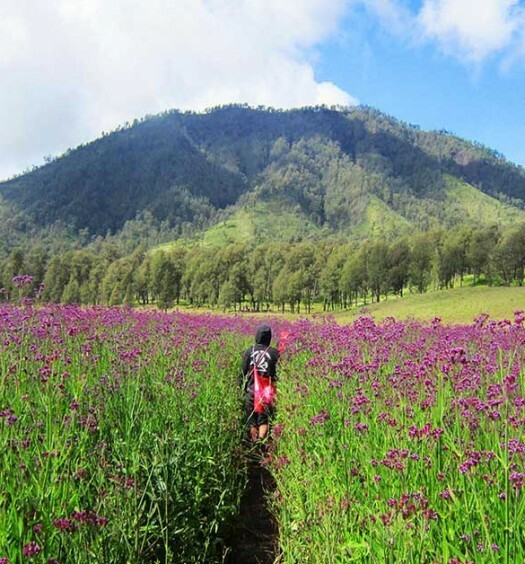 Price/Entrance fees: To enter Maribaya 3300 IDR (USD $0.30) per person, 3000 IDR (USD$0.30) per car, 2000 IDR (USD$0.20) for a parking ticket. 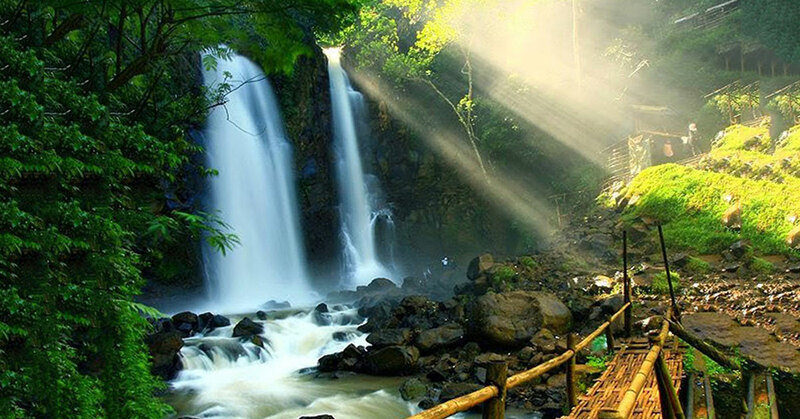 A ticket to Juanda Forest Park is 7500 IDR (USD $0.75). 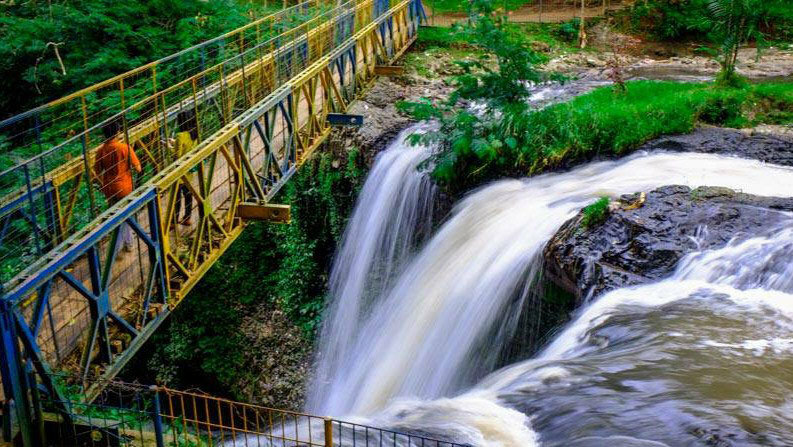 From the suspension bridge, you can view the waterfall Curug Omas from above – with a height of 30m and a depth of 10m, falling 30m from the river’s Cikawari and Cigulun. 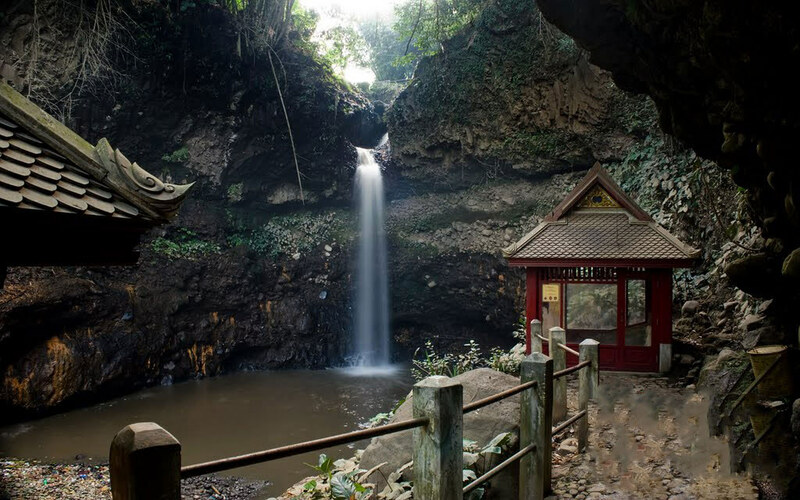 You can enter the waterfall through the WWII Dutch cave, where you will be able to see a youthful treeline and monkeys! Crystal clear waters, singing monkeys and photographic places are perfect in May. Price/Entrance fees: 8000 IDR (USD $0.80) per local person, 35,0000 IDR (USD $3.50) per foreigner. Parking is 10,000 IDR (USD $1.00) for a four-wheeled vehicle and 5,000 IDR (USD $0.50) for two-wheeled vehicles. 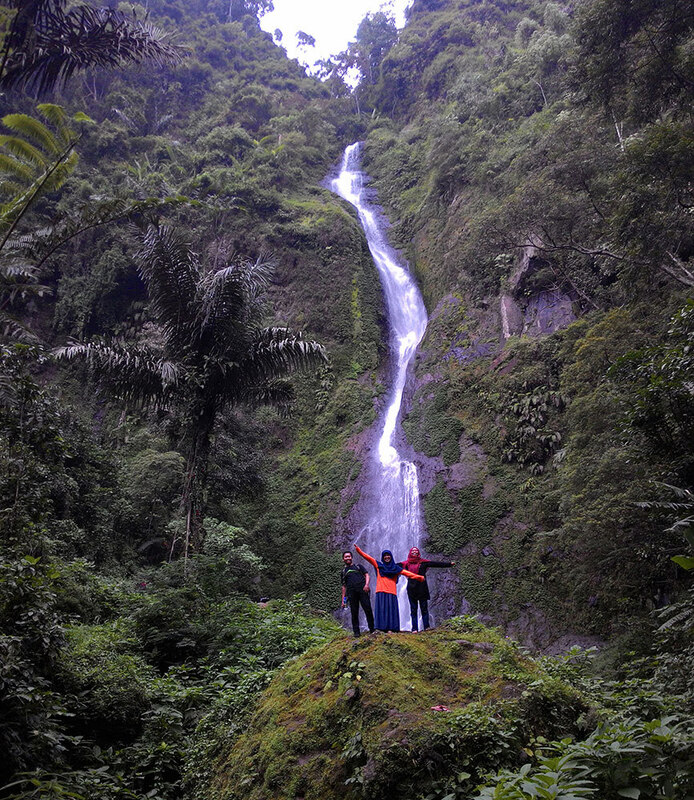 This is one of the more special waterfalls, 1800m above sea level in Juanda Forest Park – because Lalay actually means bats. 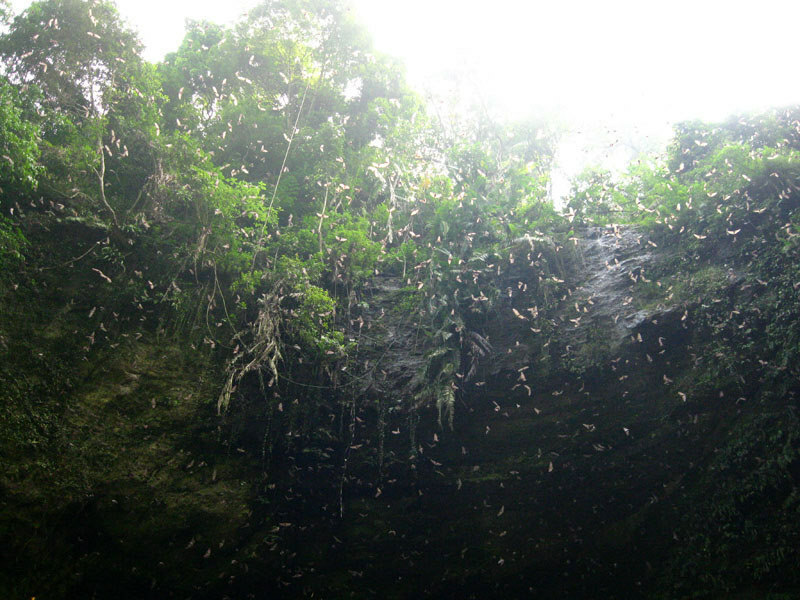 Yes, there’s a bat cave here, and it’s famous for the natural beauty that exists around this waterfall. 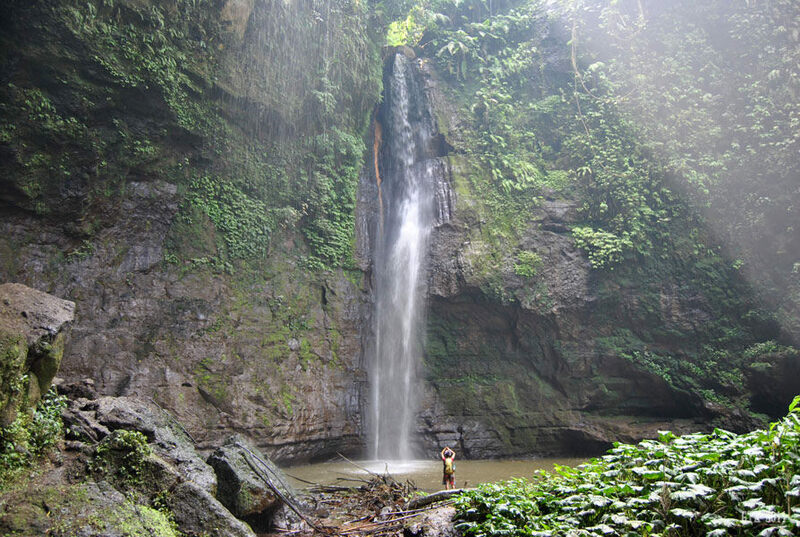 Getting to the waterfall is not an easy task, because it is rarely visited, so there are minimal signposts. There is only one sign post that you can rely on – ‘Islamic Elementary Cisasawi Cihanjuang Village’. It is highly recommended to ask the locals for directions. Getting There: Travel from the town of Cimahi at Terminal Pasar Atas via the yellow “Angkot”: the Pasar Atas – Ciuyah line. It costs around 2,500 IDR (USD $0.25). Alight before Kantor Lurah Ciutah, Citeureup Cimahi Utara. From there, you will have to go on foot, past rice fields, vegetable gardens. Follow the river flow to reach the waterfall. This walk takes about 1.5 hours. Location: Desa Padaasih, Kecamatan Cisarua, Kabupaten Bandung Barat. Do you enjoy talking to locals? The walking trails here have grown a little dense, so finding the entrance will require you to talk to the locals from Cibeusi. 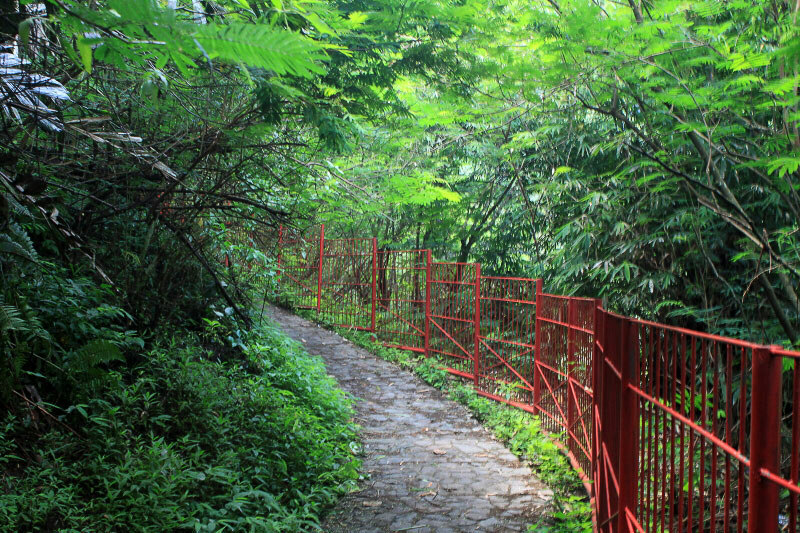 From the jungly concrete path, you will take a windy route up the hillside, where you will pass vegetable gardens on the left and a resting area with a few huts. A simple 5 km walk through lush greenery, with the occasional low branch alongside a water channel, will leave you feeling rejuvenated when you arrive. In this valley, you can hear farmers chattering while tending to their rice paddies and fresh water running as you approach the waterfall. 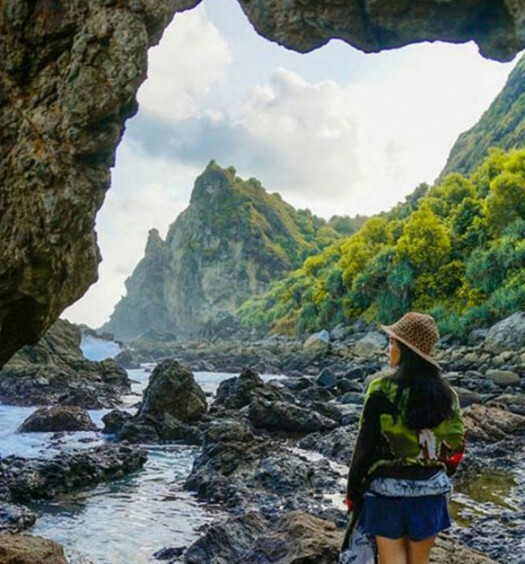 There is a high side of the ridge where you will need to take a left turn and follow the river to a small bamboo bridge to a village retreat, where you will see huts amongst the garden rocks. Here is the most enchanting spot for visitors to rest. A couple hundred metres from here, the waterfall appears all of a sudden and you can hear the loud roar. Well worth the exhilarating experience! 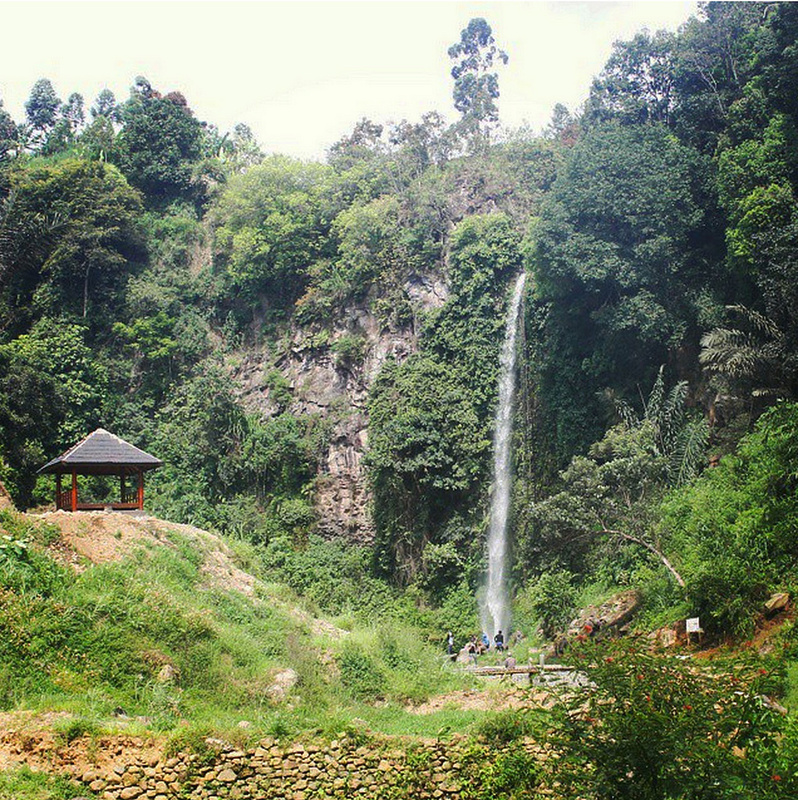 Curug Dago has an added extra dash of culture sprinkled into your trip. 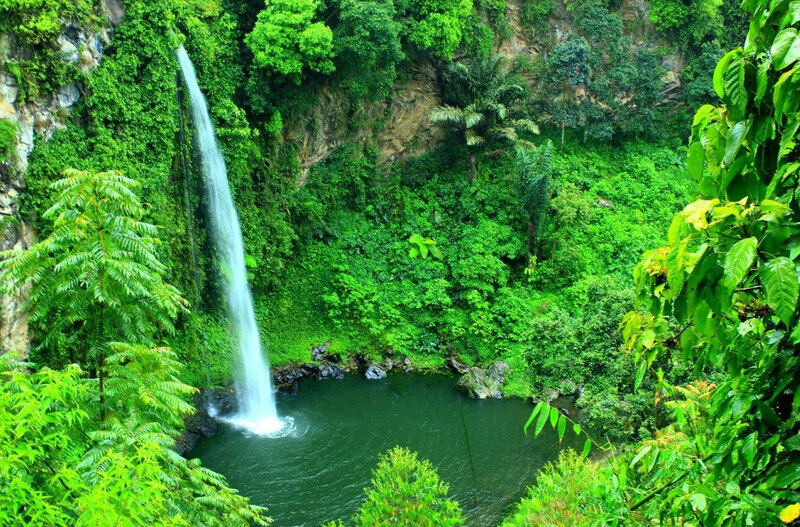 The water comes from Maribaya Cikapundung and enters the city of Bandung. Due to its location, it’s considered to be pretty hidden and only a few visitors. Not far from the waterfall, there are two inscriptions on a slate of legacy of the Kingdom of Thailand. The two inscriptions are from King Rama V and King Rama VII 1818 AD. A very peaceful place for you to just catch a breather and enjoy some time away from civilization. Here’s a beautiful valley where you can listen to crickets, dragonflies and even squirrels from the cliff. The waterfall glistens in the sunlight, bouncing off the rocks – it’s definitely necessary to get at least one commemorative photo. 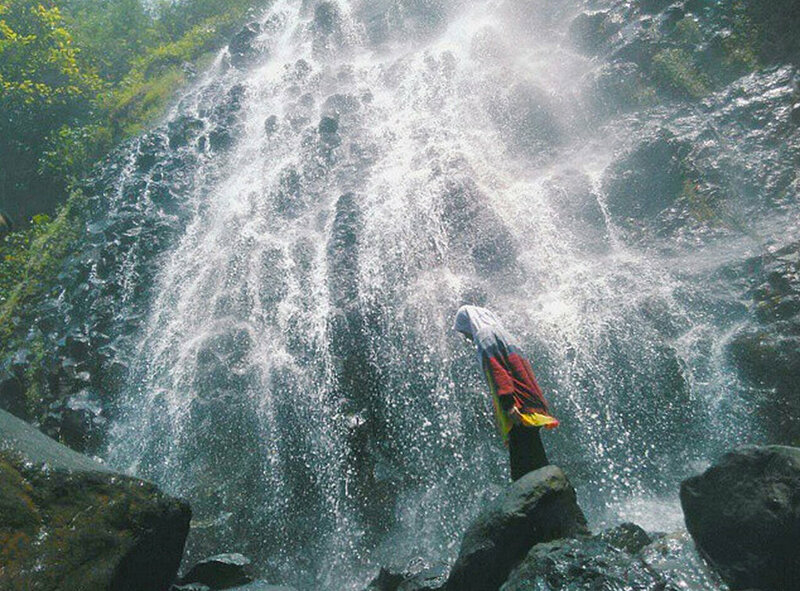 It’s unique in its own way as both waterfalls face each other like ‘penganten’ ( which means bride and groom in Bahasa Indonesia). According to a local folktale, a long time ago, there was a pair of newlyweds who was lost here, and the groom died in extreme agony at this location. Devastated, his bride killed herself soon after. This heartbreaking story adds to the serenity of the area, bathing it in beautiful melancholy. The road leads to this waterfall is unpaved and unsigned. Please trek with care as it could be dangerous. 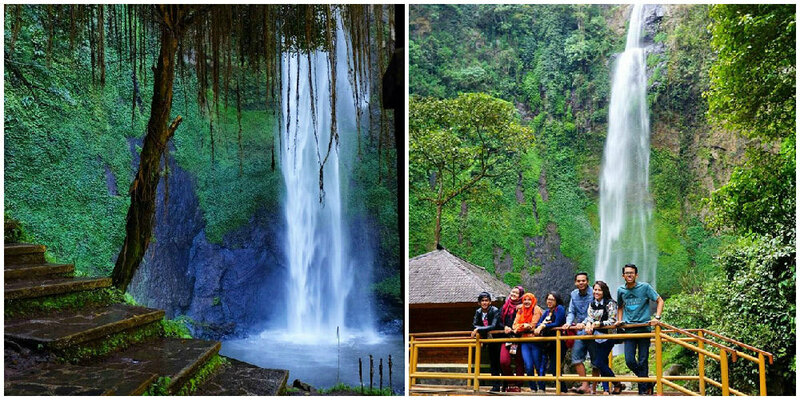 Price/Entrance fees: To the Nature Katumiri area:​ 6,000 IDR (USD$0.60) per person. 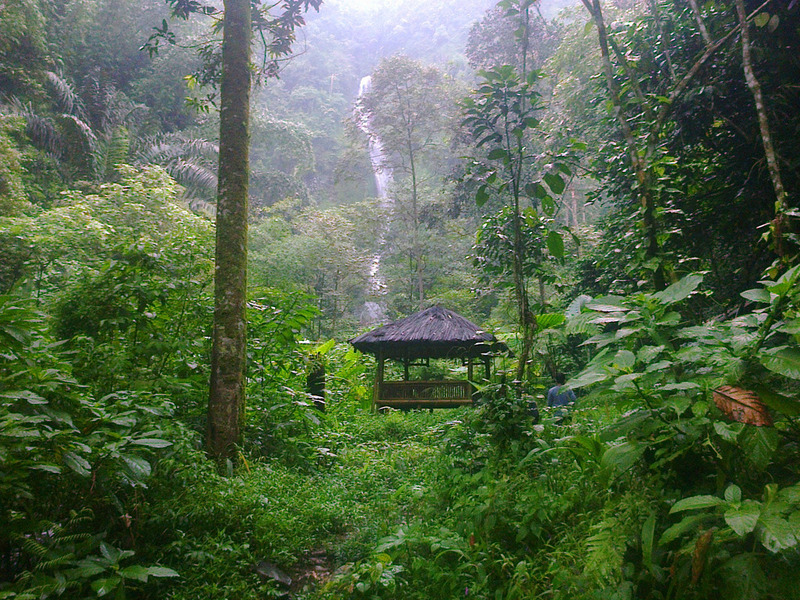 After that, another ticket of 5000 IDR (USD $0.50) to enter the waterfall area of Panganten. Do you want to find a hidden paradise, away from the tourist attractions? In Sundanese, Bugbrug means overlap. Here is a million-year-old lava formation that now shapes a dead mountain stream. With clear water and the surrounding greenery, it’s a mini paradise. 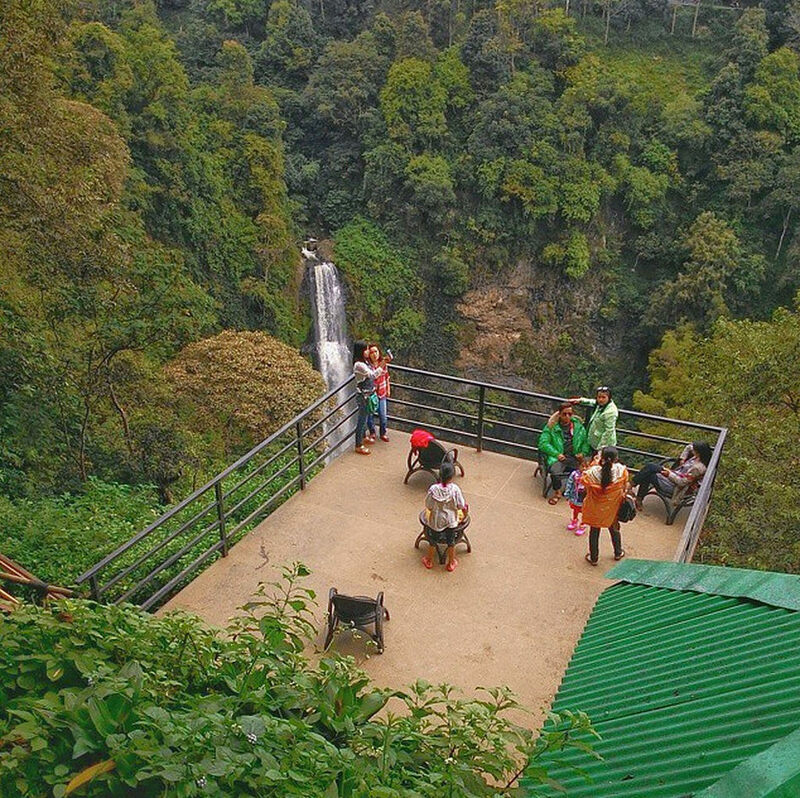 Huts and pavillions litter the west side of the waterfall, where you can enjoy a bird’s eye view of the beautiful natural water feature. If you want to dip your feet in and take some lovely photos without a million people in the background, you can either sit or stand on the rocks. 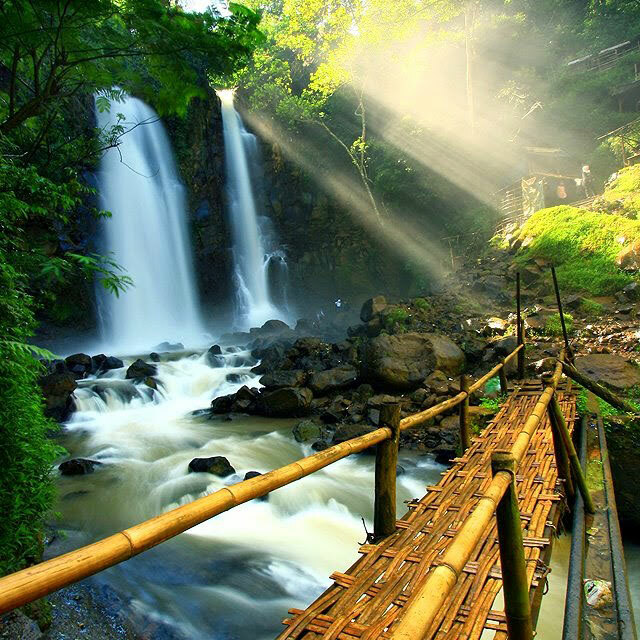 And in front of the waterfall hangs a wooden bamboo footbridge – where you can also admire the beautiful scene. Getting There: To reach the waterfall from the direction of Curug Cimahi, walk east and then right near the bridge, turn north up the path past the fields and plantations. The waterfall is located exactly on the corner of the cliff fault. Coordinates here. 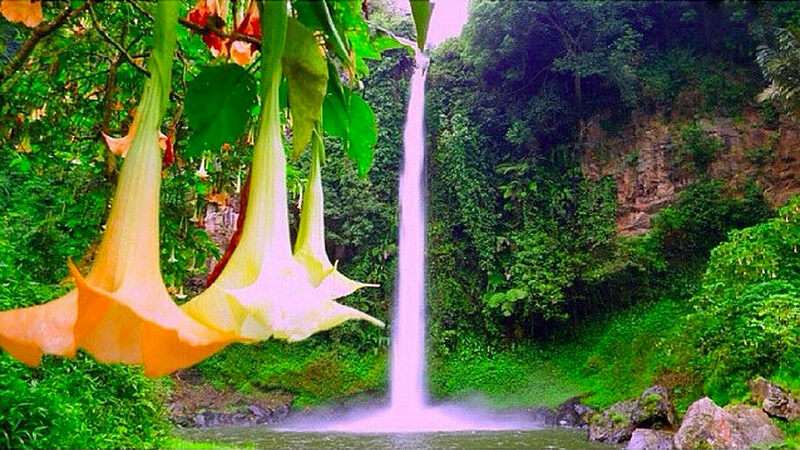 A tropical Niagara will not only astound but impress. The five segments of the waterfall that intersect into each other resembles silk falling from the cliffs. 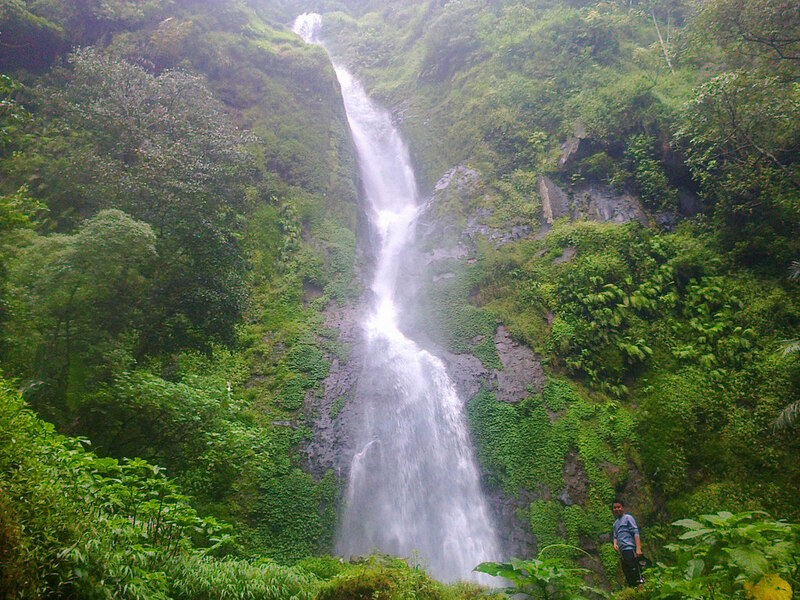 But this waterfall is often not popular due to the rough terrain. Even locals may not know about this place. 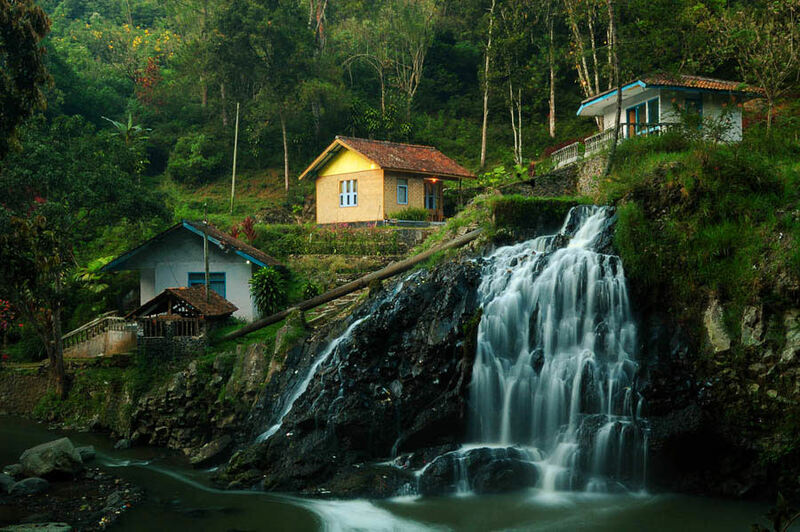 But this is makes it a fabulous adventure destination – perfect for trekking through the hilly jungle, coarse paths and a village of cicadas to reach a hidden paradise. 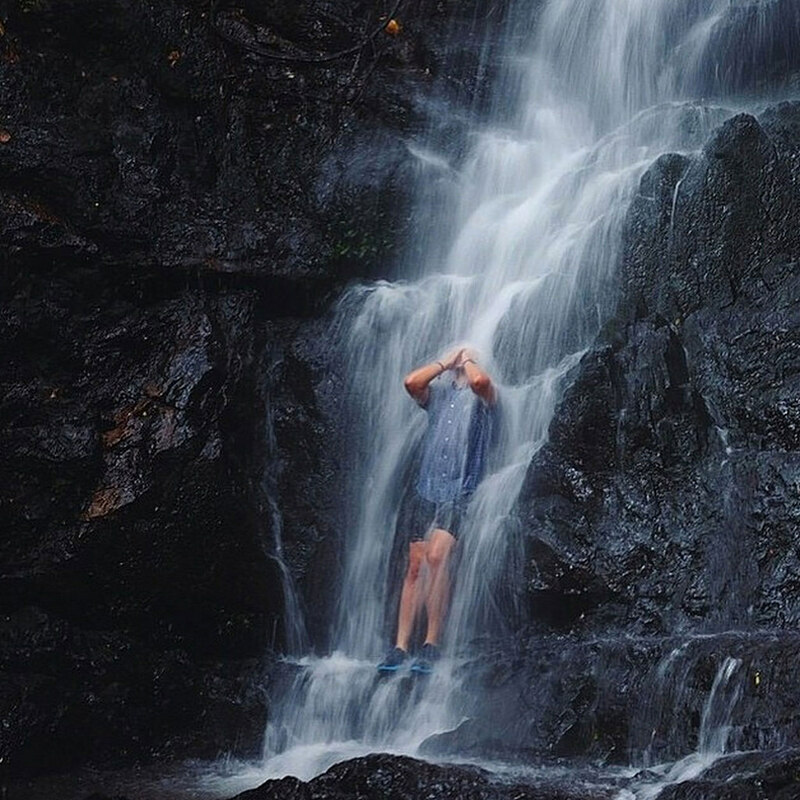 Are there any other gorgeous waterfall that needs to be on this list? Let us know today!